Wow ~ I can't believe it's been almost a month since I last blogged. Sorry~ I promise to be more consistent in the new year (one of those resolutions I'm going to work on!) but I've been super busy with (1) Christmas orders; (2) my sweet son's 4th birthday; and (3) Jesus' birthday. December is always an overwhelming combination of stress, awe, beauty and fun. I want to thank everybody for your support in 2006 . . . whether you ordered something, commented on my artwork or just looked at the website and/or blog . . . Thank You! Marymaking Designs had an amazing year and I'm looking forward to another great year in 2007. I have lots of great ideas swimming in my head (the Muses seem to be working overtime right now!) . . . . be sure to stay tuned! 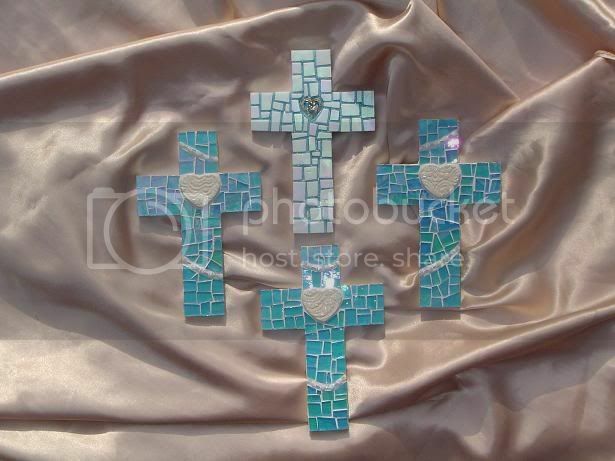 I can't believe I forgot to share this beautiful mosaic cross. It was commissioned by my client as a Baptism gift for her very special niece. 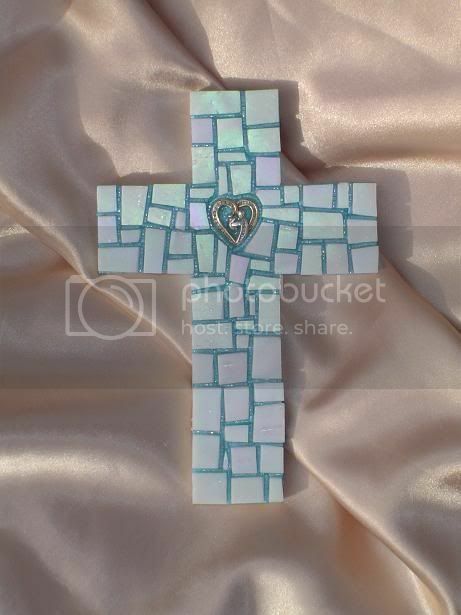 It is created on my small (7" x 11.5") cross base. No time for a lengthy, thought provoking entry . . . just want to share some recent mosaics. I hope you are enjoying the Holidays . . . don't forget the true spirit of the Christmas Season!